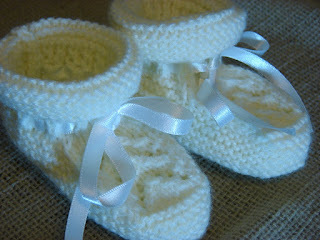 As if they're not cute enough, they're all the more special because the pattern is a vintage pattern and I've used some of my grandmother's needles. The great thing about baby knitting is the speed that you can finish things. I finished knitting these on Christmas day, just a couple of days after starting them but because I hate seaming up, they've been sat in my bag waiting. I actually knit three bootees altogether because I wasn't happy with the first one. If you're thinking of making these, my tip is that for the sole increases where it says 'm1' read 'kfb' and on the instep (top of foot - the lace pattern) where it says 'm1' read 'yo'.